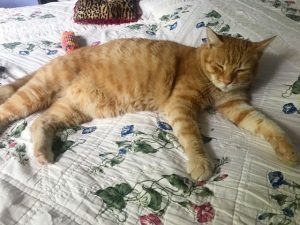 Scrappy the big orange cat here! I’m a handsome 3 & 1/2 year old boy that is super smart and affectionate and I just love being in the middle of the action. 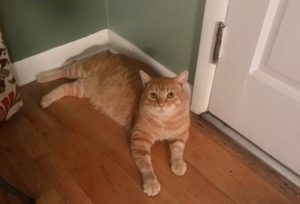 I was rescued from a trailer park where I lived outside awhile but it was obvious that I was not a wild boy — I love people too much! That being said, I still enjoy the outdoors and would love to live either an indoor-outdoor life or in a large home with lots of people and activity around to keep me busy. I’m not necessarily a lap cat, but I do adore affection and want to be around people all the time — I even sleep on my foster mom’s bed with her every night! Aside from people, my favorite things include eating, sitting on the window sill and enjoying the view, eating, soft blankets and… did I mention eating? 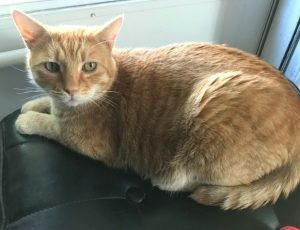 I’m a big, strong, confident boy and might be a bit much for another cat or small children, but would probably do fantastic with a dog and/or a family with older kids. I have a lot of character and I know that you’d just love me if you met me — so why don’t you stop by? I’m currently living in a foster home, so fill out an application to meet me today! I come to you fixed, vaccinated, and micro-chipped for an adoption fee of $100.